In a pond, algae blooms, or "green water", can be a difficult issue to address safely and effectively. Not anymore! The Aquascape UltraKlear UV Clarifier/Sterilizer uses a technologically-advanced T5 high output bulb, making it more efficient than traditional UV clarifiers. 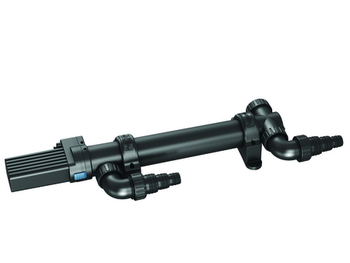 The Aquascape UltraKlear UV features a swirl sleeve that helps direct the water around the UV bulb, creating more contact time and increasing UV efficiency up to 50% over traditional UV clarifiers. UltraKlear UV Adapter Kit or the Aquascape Two-way Control Valve.